Spiderman, Spiderman, friendly neighbourhood Spiderman….. Opening night delayed again, for a full month, top earner in previews this week, it is not a “Carrie-esque” flop, perhaps the “Titanic” of the musical theater, as in, remember the doomsayers who predicted James Cameron’s film “Titanic” was going to be the biggest movie flop ever, yet became the biggest hit of its time! The broken limbs, free falls ending in the hospital, replacement leading lady hit by a flying cable….oh the marketing dream! Disaster pays! Believe me, a flood sells a million newspapers and TV coverage. A disastrous Broadway musical, possible flop, then possible hit, has me on the edge of my seat, hoping Spiderman lands at my feet or crashes on my face and I am the centre of attention in the papers, believe me the audience are there to see the results, good or bad. Will be interesting if, when it opens, and it is in shape, and the doomsayers drop off, and then it flops…..we will have to wait to see the outcome…..
Don’t get me wrong, I am not hoping for disaster, actually, I adore Julie Taymor’s visionary approach to everything, I want it to be a hit. Not that I care for the Spidey character, I just wanna see the visuals I know Julie can create, and if it is a success we can witness more of her visionary brilliance. 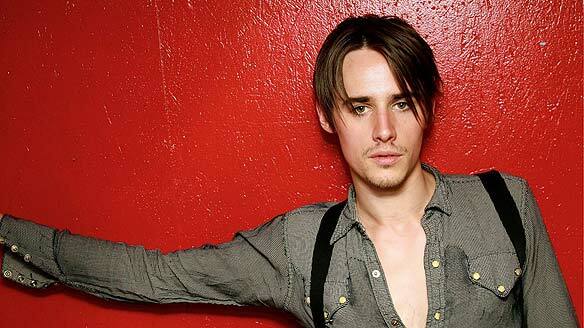 Reeve Carney…Broadway & Julie T’s Spidey….hmmmmm, maybe, must trust Julie T.
I am also interested in the new Spiderman movie reboot….Andrew Garfield, nominated for a Golden Globe for the brilliant “The Social Network” is the new Peter Parker, and he can pick my pecker (not pickled – unlike me! ) anytime. So for someone not interested in the Spidey it is very annoying that interesting people are involved in Spidey projects across all mediums. Andrew Garfield (so hot!!) 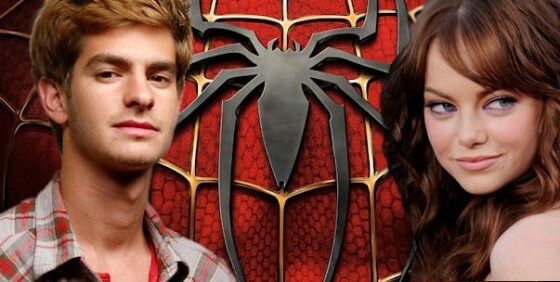 & Emma Stone (love her) the new stars of the Spidey movie reboot – good luck spunks! Damn you Julie T, Andrew Garfield, and previously Sam Raimi, I don’t like arachnids much! But happy to see what you have in your future webs. I think it was Peter Piper. And a pickled pepper. But you know I’m a pedant, Babs. Go Spidey, go Julie. Go! Very excited about the new “Spiderman” reboot; costume shot was released the other day; brand new Peter Parker, brand new costume!!!! Very flashy and reveals some clue about where the film intends to take the Peter Parker story – like the early Spidey comics, Peter Parker invents spider web cartridges for his wrists, allowing him to jump, spring and ‘fly’ through NY – instead of the recent film’s version; genetic mutation from the spider bite. Interesting.